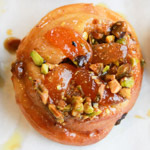 Making your own candied orange peel is easy, and for these buns it is not necessary to coat the peels in granulated sugar after cooking them in syrup. 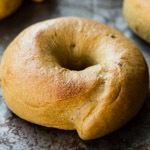 In fact, you could probably get away with using thin strips of fresh peel, since they would effectively candy themselves in the brown sugar glaze as the buns bake. 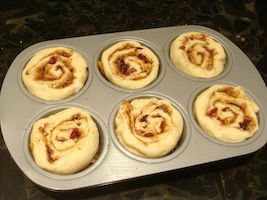 I used regular-sized muffin tins for these buns, which makes them smaller than the average sticky bun. A nice size, but you could also use jumbo muffin tins and get about 12 buns from the same amount of dough. 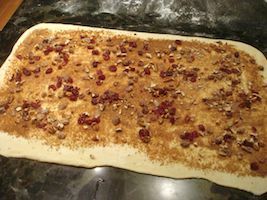 Meanwhile combine the filling sugars in a small bowl, and the filling dates, cranberries, and pecans in another bowl. 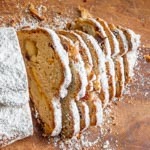 Arrange four pecan pieces on the sugar, then three or four orange peel strips. 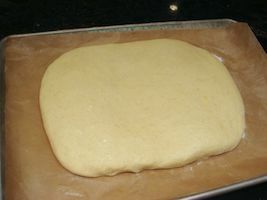 Turn the dough onto a floured counter. Roll it into a rectangle about 13 x 20 inches. 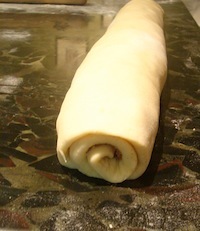 Brush the dough lightly with water. WIth a sharp knife, trim the ends off the log and then cut it into 18 rounds. 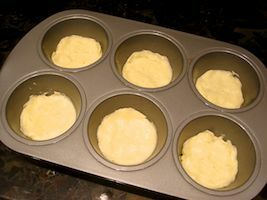 Place the rounds into the prepared muffin tins and press them down gently onto the bottom layer (which will become the topping/glaze). 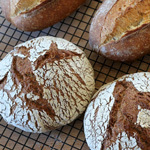 Invert immediately onto parchment-lined baking sheets, being very careful not to get any of the hot glaze on your skin. They look fantastic Susan, I’m so pleased to see you doing the PC this month, I hope there will be a lot of more occasions! 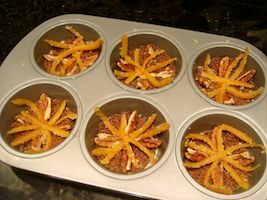 Oh wow, love the way you did the star burst with the candied orange peel! Gorgeous rolls. I don’t think I’ve ever seen better PaperChef ingredients that lend themselves so well to bread! Well that was a ‘lick the screen’ moment! Can you make monitor dust take like sticky buns? Well that was a ‘lick the screen’ moment! Can you make monitor dust taste like sticky buns? I saw the headline and was immediately smitten. Once I saw the photos, I was a goner. just too delicious. You had me on that candied orange zest. May I come over and share one Susan? Ooooh!! Christmas in August! These look fabulous, Susan. I really like this inverted thing you did with them too to ensure that the pecans didn’t get burned. Very very clever. Ooey, gooey fanstastic! They look delicious and gorgeous. these look so good, I’m almost licking my fingers, I just feel the sweet stickyness. Fabulous! 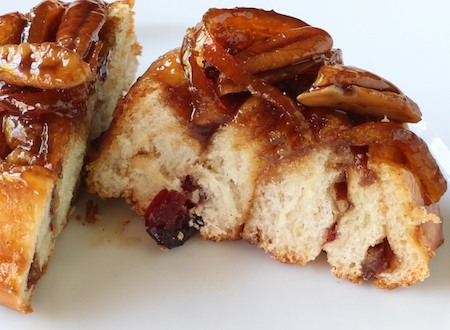 I love sticky buns. Great recipe. Ooooo. Gooey is the best. Sticky fingers signify a good recipe. 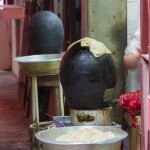 I think you would get messy from this one – must be good! Glorious goodies. 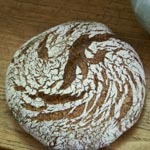 Love that flour is a given for you, like air…what a wonderful way to live Susan. These look so pretty with the arranged nuts and peel at the bottom which becomes the top. 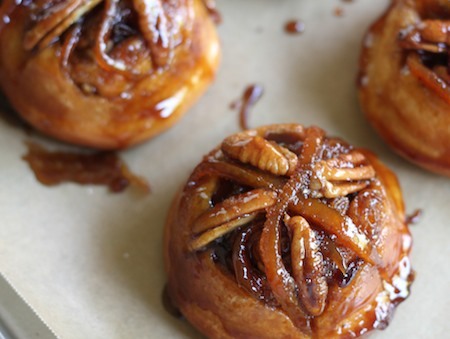 Sweet little buns, would gladly grab one for my breakfast tomorrow. The cranberries in them should provide a lovely zing to balance the caramel. Oh my goodness! 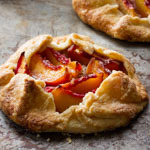 I didn’t even read the recipe before I started drooling. Look at these teasers. Yummy! 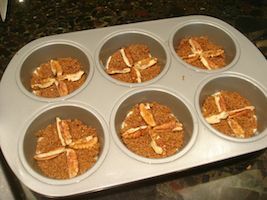 What a fun idea with the butter/sugar/nuts in the bottom of the tin cups! I’ve never seen it before. 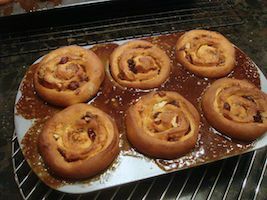 Since I’m a Swede, (cinnamon) rolls are my favorite baked goods, and, I’m ashamed to say I’v never even thought of that great idea either. One non-cooking question: what sort of counter top do you have? The picture that accompanies Step 14, makes it look like you have a very interesting and different work surface. 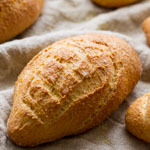 Thanks in advance for the help — and for the truly wonderful bread blog. oh my goodness, these look amazing!! i want one right NOW. I looked at the post on Pinterest and thought it was wrapped in bacon. 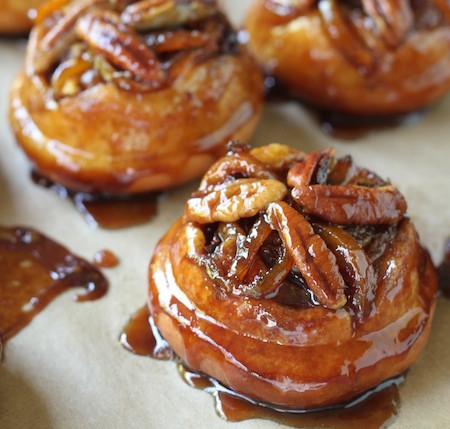 So now I have bacon wrapped sticky buns on my mind…lol. Thanks for the inspiration, I am totally going to try them and wrap them in bacon. Cheers! Karen — I love that idea!